Gov. 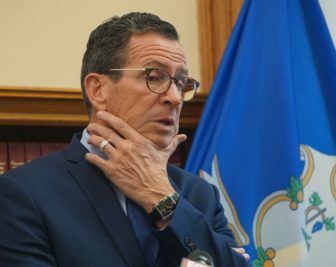 Dannel P. Malloy vetoed a measure Wednesday that would have created a new, legislature-controlled, oversight council for the Department of Children and Families. Calling it “a significant intrusion by the legislative branch into the functioning and administrative authority of an executive branch agency,” Malloy also wrote in his veto message he believes it would violate separation of powers doctrine established in state case law. “The doctrine recognizes the roles of each branch of government and the executive, legislative and judicial authority are not mutually exclusive, and of necessity overlap with each other,” the governor wrote. But he added that “the reach into executive branch functions evidenced by this bill” threatens to undermine the integrity and independence of the executive branch. The bill would replace the State Advisory Council on Children and Families — an executive branch panel charged with overseeing DCF functions — with the State Oversight Council on Children and Families. More specifically, though, it would increase its membership from 19 to 25 and replace 13 members appointed by the governor with 12 members appointed by by legislative leaders and one member appointed by the Juvenile Justice Policy and Oversight Committee chairmen. It also would add the chairs and ranking members of the legislature’s Children’s Committee as well as the state child advocate and the chief public defender to this new oversight panel. The oversight council’s duties would be expanding to monitor and evaluate DCF policies and practices related to child and youth safety and well-being, submit policy and legislative recommendations to the department. The Senate passed the measure on May 4 by a vote of 33-3 while the House approved it five days later by a 142-6 tally. Both margins easily exceed the two-third’s differential that would be needed to override the governor’s veto. Senate Republican leader Len Fasano of North Haven said Wednesday that the legislature should override this veto. Legislative leaders already are weighing a veto override session for this summer. Malloy has rejected four other bills since the regular 2018 General Assembly session adjourned on May 9. Created a new process for removing students from classrooms after a child or a teacher has been injured. The governor asserted the bill would unfairly affect minority students the most, an argument also made by the legislature’s Black and Puerto Rican Caucus. Allowed a town or city clerk to designate where voters could register on election day — a task normally assigned to the registrars of voters — in the event those officials could not agree on a location at least 31 days before the vote. Restricted the governor’s ability to reduce education grants once the fiscal year was underway to meet legislatively mandated savings targets. And extended a state manufacturing tax credit for apprentices to so-called “pass-through entities” such as S corporations, partnerships and limited liability corporations.